What are you talking about Alaska’s the biggest state in the US. I have a set of Mpow H7 over ear headphones I got a month ago. The battery life is great and the sound is good for $20, but they hurt to wear for long periods of time. I also have a pair of Airhut A3 wireless earbuds. They sound like crap and they only last for about two hours before needing to recharge, but they're convenient. I have a Plantronics gaming headset. I don't like them, I need a set that is more comfortable... I am sooo open to suggestions. It's ANZAC Day here in Australia and New Zealand. Good morning to you too, Taco-daco. My sleep was good, I'm OK.
@TheRockARooster Glad to hear that you slept well and are doing well. I’m doing pretty good. Zweillous & its line are my favorite pokemon dragons! Such cute n' chubby fluffyheads! Thirdly, Flygon has grown on me despite my hatred of the buzzy bugs! ...reeeeally needs a typing change to Bug/Dragon. It's right there in the name! Who do you think has the best and worse outfit out of you girls? It was a good day. Nice weather and got a lot accomplished. I need more days like this - hopefully it's the start of a trend. Huzzah! The Princess enjoys the boops! I'm glad that you had a good day. None right now but I might get some over the summer. Sunset and Sci-Twi, What score did you get on the SAT? I have to have a thick skin at work. You either brush it off or respond with your own witty quip. If people do continue to poke and prod relentlessly, then you just have match of wrestling or fists. Yep. I talk to myself alot when I'm baking something, writing a story, or doing a task that requires intense focus. Then sometimes, I talk to myself just because... But I don't think that makes you crazy. I think it actually is helpful. Yeah, and look at how well all of them did. Sometimes, when I'm alone for long periods of time. If you all could help me out here. 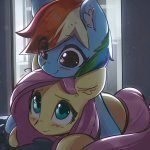 Has there been any actual episode/Lesson of the MLP series where they talked about how to actually make friends, rather than work with those you are already with? Because that's bothered me. Most everything about the show, every group of friends is already thrown together by chance or adventure & that doesn't happen in real life. You never have some big bad villain you're all roped into combating or a class your stuck with together. I know there was the one where they tried to befriend ol' bland Maud or the one where Pinkie learned to leave a body alone if they say they not interested before you wreck things & burn their house down. But how do you make friends from scratch? ...please? Anything not directly aimed at me is generally seen as a troll/not real.